la Misión del Amor está disponible en español. As a couple, you are not just living together to survive, you are being called to thrive. Your marriage is called to greatness! Engaged couples do a lot of thinking and reflecting on who they will be as one and how they work together to help each other get to heaven. But what happens after they say “I do”? Fast forward seven years, or 20, or 50. Have they followed their original plan? Do they need a refresher course on how to find joy and greatness in their marriage? The Mission of Love will help. It guides readers through the steps of re-examining their relationship and identifying their own method for success – all perfectly woven together with references to scripture, the catechism, and encyclicals that joyfully remind couples of the amazing journey they have set out on in living out the sacrament of their marriage. 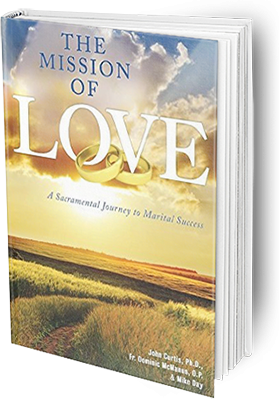 The Mission of Love guides couples in every stage of married life to re-examine their commitment to the the purpose of their vocation. More than a toolbox of to-do’s, this book is a map for success that accompanies readers in defining their own, unique path to holiness. You will not find a list of generic tips for a happy marriage. Instead, the authors offer couples a more thoughtful method to finding joy in married life that can be re-examined and returned to along every turn in their sacramental journey. With so many books on marriage out there, it’s hard to know which ones are worth reading and which ones are just a waste of precious time or worse. This is definitely one that you want to make time for! The best part about this book is its balance of the ideal and the practical, the sacred and the mundane. This book shows how good marriage really can be, but it doesn’t just spout religious doctrine or pretend that marriage is always wonderful and easy. It takes reality into account and gives practical exercises that you can do to bring about that ideal marriage that you’ve always hoped for. The book is definitely geared towards a Catholic audience, but much of its content would apply to Christians of denominations as well. Don’t worry, though, if you don’t exactly consider yourself a super churchy person. You shouldn’t find the book too overbearing or too out of reach. It says it’s meant to be used by all kinds of couples, and many of the exercises borrow from things like the world of business or the arts. So, if you are planning to get married soon or are already married, and you think that marriage is meant to be something more than a just legal designation or a one night stand in Vegas, don’t be afraid to read this book. Your marriage is meant to have a mission. It’s meant to have a purpose. It’s meant to be the very thing that makes you your best self and saves your life. Our goal is to reveal the saintly potential in your marriage. This book is the practical guide.